Guidance for assessing carbon stocks, sequestration rates, and potential emissions from degraded wetlands and seagrass beds has been developed. ref See the Resources section below for more information. Assessing carbon stocks requires mapping, soil/biomass sample collection and analysis, monitoring carbon movement into and out of the system, and determining emissions avoided from management activities. ref It is important to note that blue carbon ecosystems contain more than one carbon pool, which when added together, equals the total carbon stock. Determining which pools to measure depends on the system, the resources available, and the goal of the project. 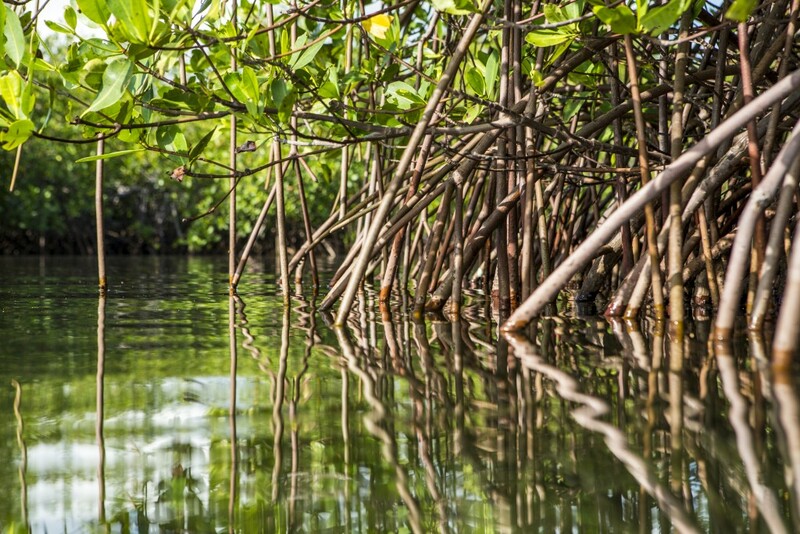 For example, measuring carbon stocks in a mangrove forest with the goal of generating carbon credits will require different protocols from measuring carbon stocks in a temperate seagrass meadow to inform marine protected area design. ref For guidance on how to assess carbon pools, see the New Manual for Measuring, Assessing, and Analyzing Coastal Blue Carbon and page 35 of Guiding Principles for Delivering Coastal Wetland Carbon Projects. It is important to differentiate between local sources of carbon (CO2 sequestered directly from the atmosphere or water column) and carbon from other areas (CO2 fixed elsewhere in the landscape that is transported and deposited on site). Further, projects should account for significant sources and sinks of CO2 (carbon dioxide), CH4 (methane), and N2O (nitrous oxide) due to project activities and actions that result in disruption of sediment supply or modified hydrology that result in nearby greenhouse gas emissions (ecological leakage). Procedures for distinguishing and accounting for autochthonous and allochthonous carbon are provided within the VCS Methodology for Tidal Wetland and Seagrass Restoration. To collect field samples for estimating the carbon content, a range of technical expertise and tools are required. For example, soil samples can be collected using low‐tech methods (e.g., driving a PVC pipe into soft mud), or high-tech methods (e.g., drilling a pneumatic coring device into a seagrass bed sediment while on scuba). Some sites may only be available at certain times (e.g., during high or low tide), thus timing of data collection is an important consideration. Once samples are collected, biophysical parameters must be quantified using laboratory analyses to estimate the total carbon pool. Lab analysis may require collaborations with research institutions.